Attack a single target dealing 308 extra damage. Attack a single target dealing extra damage equal to 13% of Attack Power plus 476. 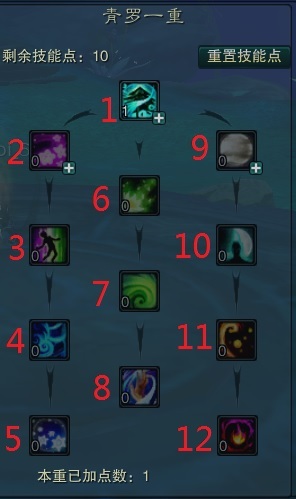 Has a 20% chance to prohibit the target from using 1 random skill for 15 sec. 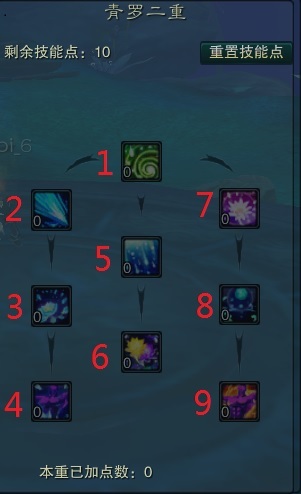 When the skill reaches rank 9, the number of skills that will be prohibited from use will increase to 2. The success rate depends on the Silence RES of the caster and the target. Bless a single target. For 10 sec, movement speed is increased. Each use raises speed by 1.5 meters / sec. Also mutually increases speed for the caster. This effect can be stacked, at most 3 times. Attack a single target 2 times, dealing extra damage equal to 15% of Attack Power plus 350. Immediately create a disc area for 20 sec. Targets that enter into this area will be slowed for 5 sec. Bless a target. There is a 100% chance to raise their Damage Reduction for 20 sec. The amount raised is 10% (The higher the caster's Critstrike Bonus, the more the amount will raise). However, the target's Critstrike Rate will be reduced by 10% and Critstrike Bonus by 90%. Attack a single target, dealing 316 extra damage. The attack hits with a 1% higher Critstrike Rate. Attack a single target 2 times, dealing extra damage equal to 14% of Attack Power plus 428. If the caster's Max HP is higher than the target's, the target will be placed under a Stun effect. The effect strength is equal to the difference between the caster's and target's Stun RES. The effect lasts 3 sec. The higher the caster's Max HP the higher the Stun strength will become. Immediately create a disc area for 20 sec. Targets entering this area will have their damage reduction weakened for 5 sec. Attack targets within 18 yards of a target, dealing extra damage equal to 10% of Attack Power. There is a 35% chance to blow targets into the air for 7 sec. Targets can receive damage and control effects while in the air. If the caster's Stun RES is 100 points or more higher than the target's Stun RES, the success chance to blow targets into the air is raised 10%. Attack a target dealing 660 extra damage. Reduce the target's Defense by 450 points for 10 sec. Immediately create an area for 15 sec. Targets entering this area will fall into a Nil-Speed condition for 3 sec. The area's strength and frequency will gradually accumulate. After numerous seconds, this area can freeze the target for 2 sec. Every 5 seconds, targets within 15 yards of the caster will be cursed. The caster will absorb 1% of the target's Max HP for 12 sec. The caster can move freely after creating the Array. Every 5 seconds, 400 Spirit is consumed to maintain the Array. Insufficient Spirit cancels the Array. Curse a single target. 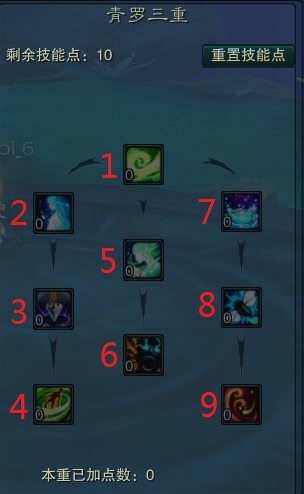 There is a fixed chance to cause the target, for 8 sec, to be unable to use skills. Forces nearby enemies within 25 yards of the target to use normal attacks on them for 9 sec. 彤云扫天 (T4 #9), a Fan Spirit will be summoned. The Fan Spirit will use the same skill to attack the target once more. Immediately create an area for 15 sec. For 3 sec, targets entering this area will have 3 buffs removed. The area's strength and frequency will gradually accumulate. After many seconds, the area can Fast the target for 2 sec. Attack a target 6 times, dealing extra damage equal to 50% of Attack Power plus 1215. Quickly attack a single target 8 times dealing extra damage equal to 40% of Attack Power plus 800. Increases the duration of 残花吹尽 (T2 #3) by 4 sec. 浮生回顾 (T1 #3) will also give a Deity Possessed buff. For 6 sec, damage will be reduced by 75%. 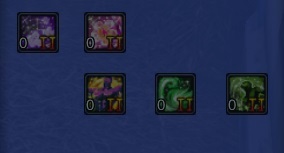 When this tome is above rank 1, 门含风帘 (T3 #4) will, after 9 sec, cause targets to enter into a Slow-Action debuff. For 4 sec, movement speed is slowed and cast time increased by 20%. Increases range to 满城风絮 (T2 #5) by 6 yards and reduce cooldown by 15 sec. Increases range to 飞鸿踏雪 (T5 #2), 飞鸿踏雪 <玄>, 飞鸿踏雪 <煞>, and 飞鸿踏雪 <禅> by 3 yards. Increases the range to 明月逐来 (T1 #10) by 4 yards. 新蝉惊晚 (T3 #8) has a 90% chance to bleed the target for 4 sec. The bleed amount equals 2% of the caster's current HP. Extends duration to 晴沙絮舞 (T2 #8) by 4 sec. 研彻晓光 (T2 #9) will make target immune to Stun for 12 sec. 风行碧落 (T5 #4.2), 风行碧落 <玄>, 风行碧落 <煞>, and 风行碧落 <禅> cooldown is reduced by 15 sec. 舞破重山 (T5 #3), 舞破重山 <玄>, 舞破重山 <煞>, and 舞破重山 <禅> will provide a reflect effect to the caster for 6 sec. 碧柳摇风 (T1 #7) duration is increased by 4 sec and movement speed is raised 0.2 yards / sec. When 缓分花陌 (T2 #6) reaches rank 6, the Stun duration will be extended 1 sec. 缓分花陌 (T2 #6) will ignore the difference in HP and attach a Spirit Burn effect. The Spirit Burn amount is 2500 plus 40% of the caster's current Spirit. 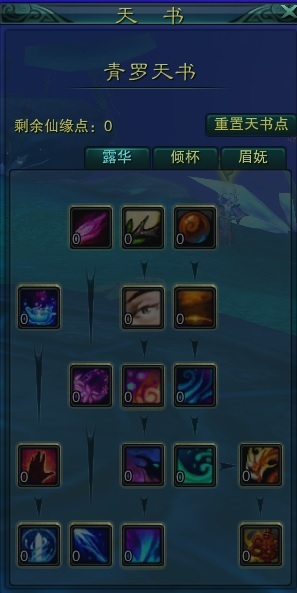 乱花如雨 (T4 #1) will attach 3.0% of Attack Power plus 66 to damage and reduce cooldown by 2 sec. 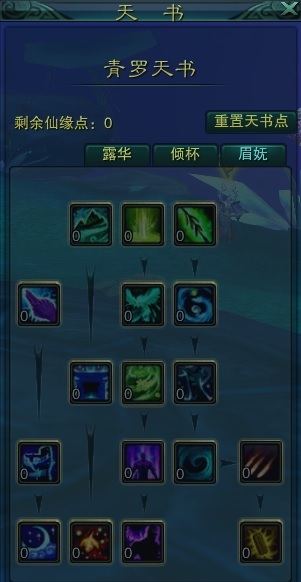 Each hit to 乱花如雨 (T4 #1) will have a 2% chance to ignore 10% of the targets' Critnull. 小径香残 (T5 #1), 小径香残 <玄>, 小径香残 <煞>, and 小径香残 <禅> will recover the caster's Spirit. The amount recovered is equal to 45% of the caster's total RES. The caster will be immune to damage and normal control effects for 8 sec. 10 sec after the effect is over, a damage-settlement will take 10% of the ignored damage from the caster's health. This damage-settlement effect will not kill the caster. This effect cannot be used again until 45 sec have elapsed. Curse a single target, blowing them up into the air for 5 sec. The success rate is related to the caster's total RES. Attack a single target 2 times, dealing extra damage equal to 50% of Attack Power. Attack a single target dealing extra damage equal to 20% of Attack Power plus 1000. The attack deals extra damage equal to the caster's total RES multiplied by 5.
there will be a 100% chance to place the target in a Slow-Action effect for 10 sec. Attack a single target, dealing extra damage equal to 20% of Attack Power plus 380. Attack a single target dealing extra damage equal to 100% of Attack Power plus 1500. The cooldown to 夭桃繁杏 (T4 #6) is reduced by 10 sec. When the skill reaches rank 10, the cooldown will further be reduced by 3 sec. 晴云点波 (T1 #11), 湘云织玉 (T3 #9), 彤云扫天 (T4 #9), and 彤云扫天2 a Fan Spirit will be summoned. The Fan Spirit will use the same skill to attack the target once more. The attributes of the Fan Spirit are related to the caster. Only 2 Fan Spirits can be summoned at a time. 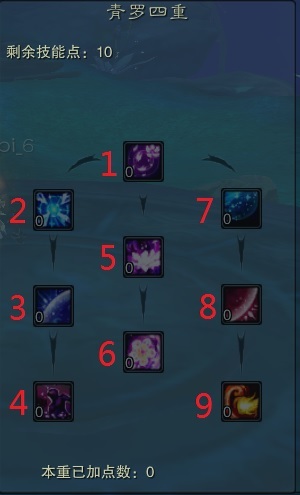 Has a 100% chance to enter a Drunk condition (courage wine AP buff), increasing Skill Damage by 50% for 20 sec. Attack a target 6 times, dealing extra damage equal to 100% of AP plus 1089. The 2nd, 4th, and 6th hit will deal additional damage equal to 10% of Health. While under the buff to 舞破重山 (T5 #3), damage will raise by 10% of Attack Power. The 2nd hit will slow the target by 50% for 5 sec. The 4th hit will Paralyze the target. The paralyze strength equals the caster's Paralyze RES plus 20 points. The effect lasts 4 sec. The 6th hit will Silence the target. The silence strength equals the caster's Silence RES plus 20 points. * The caster can move freely after creating the Array. * Every 5 seconds, 550 Spirit is consumed to maintain the Array. * Insufficient Spirit cancels the Array. * Cast this skill again to deactivate the Array. Has a 40% chance to blow the target into the air for 10.0 sec. While the target is in the air, they will not receive damage or negative efffects. 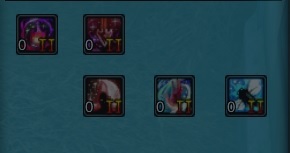 Reduces the cooldown to 浮生回顾 (T1 #3) by 20 sec. 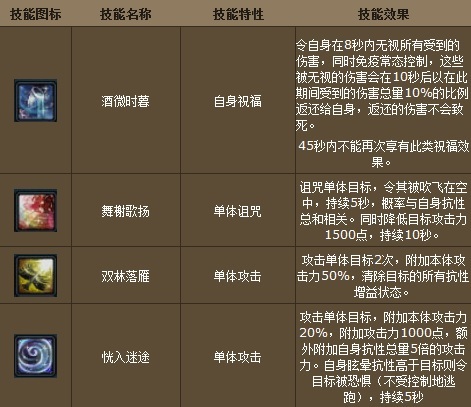 The 浮生回顾 (T1 #3) skill will give the blessed target a Deity Possessed buff. For 10 sec, damage will be reduced by 80%. The amount reduced cannot exceed the caster's Max HP multiplied by 5.0. Increases the duration of the Fear effect to 骊歌一叠 (T3 #6) by 5.0 sec. then the first blessing will cause the target's Critshield to raise by 100% for 10 sec. The second blessing will increase the target's RES by 60 points for 10 sec. the first blessing will cause the target's Critstrike Bonus to raise by 80% for 20 sec. Attack a single target 3 times, dealing extra damage equal to 20% of Attack Power plus 598. Curses enemies within 15 yards of a target, placing them under a Weaken effect. Attack Power is reduced by 5%. The Weaken effect strength equals the caster's Weaken RES plus 5 points and lasts for 6 sec. 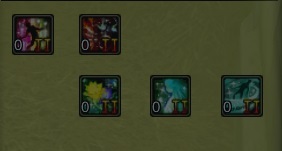 When the skill reaches rank 20, the Weaken effect's duration will extend by 4 sec. 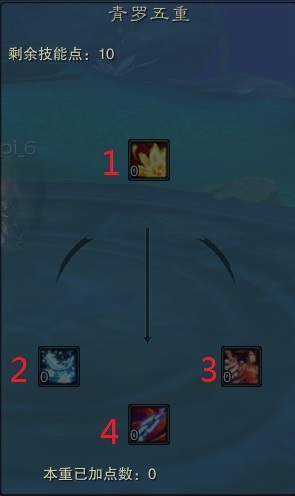 If the Weaken effect is successful, the damage dealt to the target raises each time they are struck for 6 sec. Each hit increases damage equal to 1% of the caster's Max Attack Power. Attack a single target, dealing extra damage equal to 62% of Attack Power plus 1621. The attack deals extra damage equal to double the caster's Weaken RES. After damaging the target, it will begin a transfer attack, striking nearby targets in mere seconds. The strikes will give priority to the closest targets, being able to strike up to 6 targets. Each strike will gradually increase in damage by 25%. The transfer attack does not affect mobs. Cooldown is 89 sec. Additionally slows affected targets by 5% for 2.5 sec. Quickly attack a single target 8 times, dealing extra damage equal to 30% of Attack Power plus 256. Attack a single target 3 times, dealing extra damage equal to 20% of Attack Power plus 2479. Curses enemies within 15 yards of a target, placing them under a Weaken effect. Attack Power is reduced by 100%. The Weaken effect strength equals the caster's Weaken RES plus 100 points and lasts for 6 sec. Each hit increases damage equal to 20% of the caster's Max Attack Power. Each hit of 晴云点波 (T1 #11), 湘云织玉 (T3 #9), and 彤云扫天 (T4 #9) will attach 3%, 6%, and 9%, respectively, of Attack Power as extra damage. Each hit of 彤云扫天 2 will deal extra damage equal to 10% of Attack Power. Attack a single target, dealing extra damage equal to 100% of Attack Power plus 2548. The attack deals extra damage equal to double the caster's Silence RES. Quickly attack a single target 8 times, dealing extra damage equal to 220% of Attack Power plus 5376. Each hit of 晴云点波 (T1 #11), 湘云织玉 (T3 #9), and 彤云扫天 (T4 #9) will attach 3%, 6%, and 9%, respectively, of Attack Power. Instantly recovers 5% of the caster's Vigor and raises the RES increase effect to the tome 临晚镜 (B2 #17) by 2%. The attack deals extra damage equal to double the caster's Stun RES. Bless a target. Has a 20% chance to ignore 50% of received damage and be immune to normal control effects for 23 sec. After the effect is over, a damage-settlement will take 40% of ignored damage from the caster. This will not kill the caster. For every 10 points of Skill Evasion the caster has, the amount of damage ignored will raise by 3%. The higher the caster's total RES, the higher the trigger chance will become. The caster will be immune to damage and debuffs 24 times for 12 sec. The same target cannot retake this blessing effect until 30 sec have elapsed. CD is 45 sec. Attack targets 6 times, dealing extra damage equal to 100% of Attack Power, plus 1077. While under the 舞破重山 (T5 #3) buff, the skill will deal more damage equal to 10% of Attack Power. Attack a target 6 times, dealing extra damage equal to 100% of Attack Power, plus 1077. Effect: Attack a target. After receiving damage, the caster will recover Health. Effect: Attack a single target and deals additional damage. Effect: Attack a single target, reducing their Max Spirit. Has a fixed chance to blow target into the air.